It may seem silly to have a whole video dedicated to the seemingly simple act of pressing a guitar string against the fretboard. How hard can it be? Well, there's actually a right way, and a bajillion wrong ways, to fret a note. So let's start on the right foot...er, fingertip. Before we start, let's choose a note to practice on. I like 1st string, 5th fret. Remember, your 1st string is the thinnest one, and it's closest to the floor. Find the string, and count up five frets. Before you fret your note, check in with your thumb. Once you've learned a bunch of chords, you'll find that your thumb placement will vary depending on what you're doing. But for starters, we're going to use the thumb hook position. Start by holding out your fretting hand, palm up. Make an OK sign, and open it up a bit. Now hook your thumb over the top of the neck in the neighborhood of the 5th fret. Relax your arm so that your hand hangs off that hook. For now, it's OK if your thumb touches the 6th string. Make sure your palm isn't pressed against the back of the neck. Just hang like this. Now using your 1st finger, press the 1st string down right next to the higher fretwire. This is the fretwire closer to the body of the guitar. Let's call it the highwire. It's a name I made up. And let's see how it sounds. For now, you can pick by placing the four fingers of your picking hand below the strings on the body of the guitar. Put 'em below the soundhole if you're playing an acoustic, or below the pickups if you have an electric. Now pick the 1st string with your thumb. Listen to your note. Does it sound clear? If it's buzzing like this, you might need to get closer to the fret wire. If you're already as close as you can get, try pressing harder. If it's muted like this, you're probably on top of the highwire. Get off that thing! You want to be as close as you can without touching it. Pause the video if you like and troubleshoot a bit. Then let me give you a couple more tips. Arching means bending your finger to form an arch. Obviously, you need to bend it somewhat to get it anywhere near the frets, but arching means making a high enough arch to contact the string with the tip of your finger. The string should be connecting just a few millimeters south of where your nail attaches to your fingertip. Here's the dent left by the string so that you can see where I'm fretting. Arching will give you a little more leverage to press down on the string, and it'll be necessary once you start fretting chords so that you don't mute neighboring strings. Unfortunately, arching will also probably hurt your fingertip. OK, I've got high expectations for this next bit. I want you to really dig in, and go for a whopping D minus for effort. So what am I talking about? I've taught hundreds of beginners, and almost all of them pressed too hard when they started fretting. The only ones who didn't were the ones who couldn't, because they lacked strength. So you're probably pressing too hard, too. You should only be fretting hard enough to get the note to ring clearly. If you're not able to play a clear note, I recommend skipping ahead to the troubleshooting section. Otherwise, here's how you tell how hard you should be pressing. Watch me go through this process once, then you try it. Let's use a scale of 1-10 to describe the pressure you're putting on the string. 1 is the lightest caress, and 10 is drawing blood. You're going to press with a 9, nice and hard, and start picking the string. Now release pressure the smallest amount you can, down to an 8. Keep picking. Now come down to a 7. At some point, your note's going to start buzzing, or become muted altogether. If it becomes muted, that means you released pressure too quickly. Start at 9 and work your way down again. What you want to find is the point at which the string buzzes. I'm at about 5 here, and it's buzzing. Once you get yours to buzz, add just 1 increment of pressure, just enough to make your note clear again. This is how hard you should press. Let's call it your pressure number. From now on, I want you to get a D minus for effort when you fret, just do the bare minimum, and remembering your pressure number will help you do that. Alright, before we finish with this section, let's practice fretting a note with minimum effort from the get-go. Roll your shoulders, wiggle your spine, relax your body. 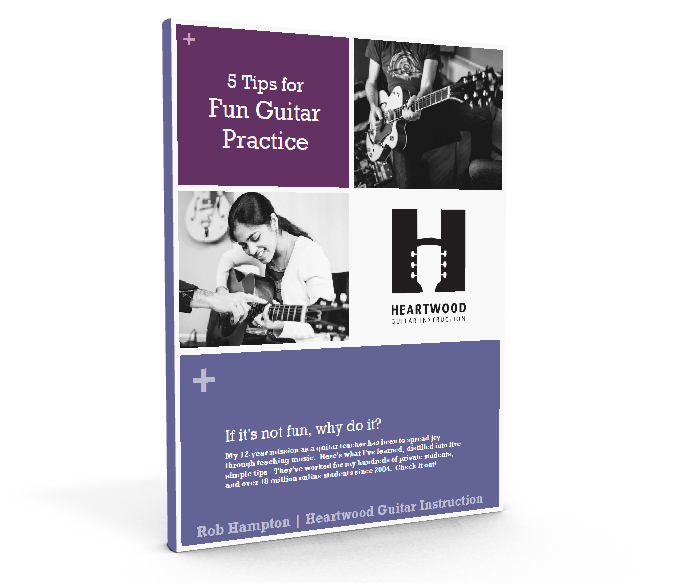 Now hang that hook on the 5th fret, arch your finger, aim right next to the high wire, and fret that note up to your pressure number. Pick it. Now double-check it by releasing pressure by one degree and see if it buzzes. It may take a while to press accurately--your finger's probably hurting by now, and the dent in your fingertip doesn't help either. Pause the video here and do 10 repetitions of this exercise--fret using your pressure number, test. If it's buzzy or muted, you undershot: Press harder and test again. If it rings clear, you either nailed it, or overshot. Release pressure by 1 degree and see if it buzzes. If it does, you nailed it. The usual suspects when a note's buzzing are: You're not close enough to the highwire, you're not pressing hard enough, your nails are too long, or your guitar's just buzzy. So get close to the highwire: You should be as close to it as you can without touching the wire. If you're having trouble pressing hard enough, try an different thumb position. Drop your thumb down behind the neck, so that you can pinch the string against the fretboard. And finally, keep your fretting fingers' nails trimmed as close as is comfortable, so that they don't prevent you from fretting when arching your fingers. If the tip of your nail hits the fretboard, it's going to prevent you from pushing the string down all the way. Look at your nails like this. Can you see your fingertips extend beyond the end of your fingernail? If not, your nails are probably getting in the way. Now some people's nail beds extend all the way to the tips of their fingers. So there's no way they can trim their nails back far enough to get them out of the way. This will make fretting more difficult, but try using your nails to your advantage by using them to fret the string. Angle your fingers like this and dig that nail into the string. If you've ruled out these other suspects, it's possible that your guitar is a buzzy guitar. Electric guitars for example, usually have a bit of fret buzz--even really nice ones that have been set up well. It's the price you pay for having low action, meaning the strings are close to the fretboard, and for having lighter-gauge strings. Both these qualities make electric guitars easier to play than acoustics, but it also makes them buzz more. In my opinion, the buzz becomes unacceptable when you can hear it through your amp, or if your notes are unnaturally quiet or are decaying too quickly, meaning they're getting quiet too quickly. If that's happening, your guitar needs a setup. It costs about $40. Acoustic guitars will buzz a bit, too, if you really lay into them. If you're a tortured soul and this is the sound you're going for, more power to ya. If not, grip your pick less tightly or use a thinner pick. Your finger hurts. Is it your skin that hurts, or is it joint pain? If it's skin, I'm afraid that's how it's going to be for a few weeks. Like AC/DC says, "It's a long way to the top if you wanna rock and roll," and the first few miles of that climb are the most painful. But if you practice until your fingertips are sore every day for about two weeks, you'll start developing callouses. Not only will this mean an end to the pain, but the strings also won't sink into your tender skin as much, which means you won't have to press as hard. Until that happens though, no pain no gain. Now if you're getting joint pain, that's another story. Review the D Minus for Effort section in this video. I'm also hoping to have a lesson on ergonomics in this course--check it out if it exists. If that still doesn't help, consult with your doctor or a guitar teacher who specializes in ergonomics. Repetitive stress injuries are common among professional guitarists, and I have my share, so I can say from personal experience: Be careful with your body. We're going to spend a lot of time working on picking, because, as you've already discovered, picking the right string is the hardest part of playing the guitar. But for now, place fingers below the strings, pick with your thumb, and remember to use your eyes. Once you've got your fretting finger where you want it, look at your picking hand before you pick. It's a lot easier when you're watching what you're doing.